The U.S. biodiesel industry had to prove its durability in 2015, but the release of finalized RVOs and reinstatement of the blender tax credit offer many a hopeful outlook for 2016. A 15 MMgy biodiesel plant in New Haven, Connecticut, formerly known as Greenleaf Biofuels, has been acquired by Kolmar Americas Inc., a subsidiary of Swiss firm Kolmar Group AG, and renamed American GreenFuels. Kolmar made the announcement Jan. 5. Joseph Furando of Cima Green was sentenced to 20 years in prison and to pay more than $56 million in restitution for his role in an elaborate scheme to defraud biodiesel buyers and U.S. taxpayers by fraudulently selling biodiesel incentives. Several U.S. producers, including Genuine Bio-Fuel, Hero BX and the now-defunct Promethean Biofuels, in addition to Miami-based biodiesel exporter and hopeful technology provider Lagosur, sketch out overviews of international developments. In part because of the success demonstrated in California with its low carbon fuel standard (LCFS), both Oregon and British Columbia have also adopted low carbon transportation policies, and they are setting precedent for the rest of the world. 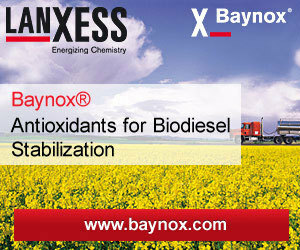 Biodiesel is a real solution to reducing carbon emissions and mitigating the threat of climate change the world over. Many countries are adopting plans to reduce greenhouse gases, and biodiesel is an effective part of those measures. Australia-based Algae.Tec Ltd. has completed commissioning and initial startup of its 50-ton-per-year algae production plant to produce algae-based nutraceutical products at the company’s Manufacturing & Development Centre in Atlanta. The National Biodiesel Board announced Jan. 6 it has hired Washington, D.C., attorney Sandra Franco as general counsel. Franco previously was a partner at Morgan Lewis, where she specialized in the Clean Air Act and natural resources law. Arc Logistics Partners LP announced that it has entered into an agreement to acquire from Gulf Oil Limited Partnership four refined products terminals in Pennsylvania located in Altoona, Mechanicsburg, Dupont and South Williamsport. Onsite Energy Management magazine has announced the Onsite Energy Conference & Expo will take place April 11-13, 2016, at the Charlotte Convention Center in North Carolina. The event is colocated with the International Biomass Conference & Expo. The U.S. Department of Justice, on behalf of the U.S. EPA, filed a civil complaint Jan. 4 in federal court in Detroit against VW. The action is an attempt to hold VW accountable for unlawful air pollution resulting from its emissions defeat devices.